The first born according to Genesis chapter 4 verse 1 was Cain. Verse 2 Abel is born and note that Adam was their father. Chapter 4 verse 1: And Adam knew Eve his wife and she conceived and bare Cain. That rules out any speculation formed by the serpent seed doctrine that Cain was the physical offspring of Satan through the serpent having sexual relations with Eve. 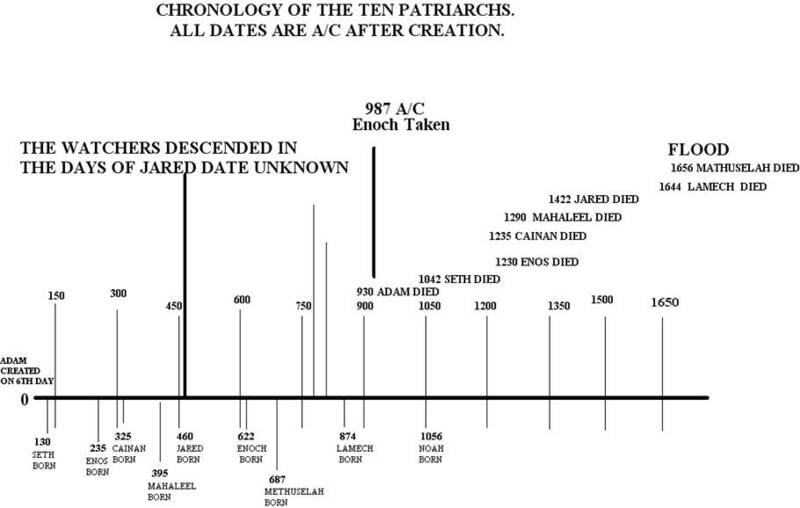 We know from the book of Enoch that the angelic infiltration did not occur until between 400 and 600 years after creation during the days of Jared. The scriptures explain clearly that this was NOT the case and that in fact Adam was the father of them both. The word knew here in the Hebrew indicates the most intimate relationship between a man and a woman, the sexual bond. Cain, 15 years old, and Abel 12 years old, grow apart. “1 But when Adam saw that the older brother hated the younger, he endeavoured to soften their hearts, and said to Cain, "O my son, take of the fruits of your sowing and make an offering to God, so that He might forgive you for your wickedness and sin." 2 He said also to Abel, "Take some of your sowing and make an offering and bring it to God, so that He might forgive you for your wickedness and sin." 3 Then Abel obeyed his father's voice, took some of his sowing, and made a good offering, and said to his father, Adam, "Come with me and show me how to offer it up." 4 And they went, Adam and Eve with him, and they showed him how to offer up his gift on the altar. Then after that, they stood up and prayed that God would accept Abel's offering. 5 Then God looked at Abel and accepted his offering. And God was more pleased with Abel than with his offering, because of his good heart and pure body. There was no trace of guile in him. 6 Then they came down from the altar, and went to the cave in which they lived. But Abel, by reason of his joy at having made his offering, repeated it three times a week, after the example of his father Adam. 7 But as to Cain, he did not want to make an offering, but after his father became very angry, he offered up a gift once. He took the smallest of his sheep for an offering and when he offered it up; his eyes were on the lamb. 8 Therefore God did not accept his offering, because his heart was full of murderous thoughts. The earliest prophesy of the coming of Christ. come down from heaven, and shall become flesh of your descendants, and take on Myself the infirmity from which you suffer, then the darkness that covered you in this cave shall cover Me in the grave, when I am in the flesh of your descendants. 5 And I, who am without years, shall be subject to the reckoning of years, of times, of months, and of days, and I shall be reckoned as one of the sons of men, in order to save you." 6 And God ceased to commune with Adam. 1 Then the merciful God, good and lover of men, looked at Adam and Eve, and at their blood, which they had held up as an offering to Him; without an order from Him for so doing. But He wondered at them; and accepted their offerings. 2 And God sent from His presence a bright fire, that consumed their offering. 3 He smelled the sweet savor of their offering, and showed them mercy. 4 Then came the Word of God to Adam, and said to him, "O Adam, as you have shed your blood, so will I shed My own blood when I become flesh of your descendants; and as you died, O Adam, so also will I die. And as you built an altar, so also will I make for you an altar of the earth; and as you offered your blood on it, so also will I offer My blood on an altar on the earth. 5 And as you sued for forgiveness through that blood, so also will I make My blood forgiveness of sins, and erase transgressions in it. 6 And now, behold, I have accepted your offering, O Adam, but the days of the covenant in which I have bound you are not fulfilled. When they are fulfilled, then will I bring you back into the garden. 7 Now, therefore, strengthen your heart; and when sorrow comes over you, make Me an offering, and I will be favourable to you." Genesis 4:17 deals with generations and the offspring of Cain after he went out from the presence of the Lord. What I would like to do here is make a comparison of the line of Cain and the line of Adam through Seth who was born to replace Abel who had been murdered by Cain and at the end of it we should come to an amazing conclusion. 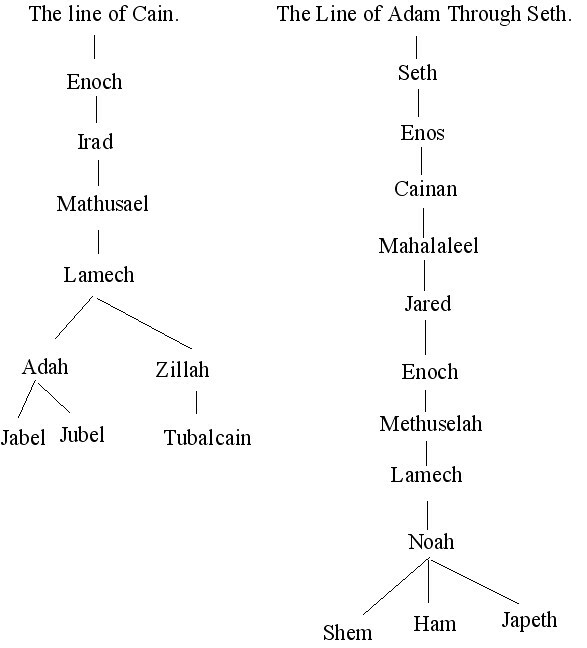 Chapter 5 deals with the line from Seth to the sons of Noah Shem ham and Japheth. GENESIS CHAPTER 5 VERSES 1 TO 32. Gen 5:1 This is the book of the generations of Adam. In the day that God created man, in the likeness of God made he him; 2 Male and female created he them; and blessed them, and called their name Adam, in the day when they were created. 3 And Adam lived an hundred and thirty years, and begat a son in his own likeness, after his image; and called his name Seth: 4 And the days of Adam after he had begotten Seth were eight hundred years: and he begat sons and daughters: 5 And all the days that Adam lived were nine hundred and thirty years: and he died. 6 And Seth lived an hundred and five years, and begat Enos::7 And Seth lived after he begat Enos eight hundred and seven years, and begat sons and daughters:8 And all the days of Seth were nine hundred and twelve years: and he died.9 And Enos lived ninety years, and begat Cainan:10 And Enos lived after he begat Cainan eight hundred and fifteen years, and begat sons and daughters:11 And all the days of Enos were nine hundred and five years: and he died.12 And Cainan lived seventy years, and begat Mahalaleel 13 And Cainan lived after he begat Mahalaleel eight hundred and forty years, and begat sons and daughters:14 And all the days of Cainan were nine hundred and ten years: and he died. 15 And Mahalaleel lived sixty and five years, and begat Jared:16 And Mahalaleel lived after he begat Jared eight hundred and thirty years, and begat sons and daughters:17 And all the days of Mahalaleel were eight hundred ninety and five years: and he died.18 And Jared lived an hundred sixty and two years, and he begat Enoch 19 And Jared lived after he begat Enoch eight hundred years, and begat sons and daughters 20 And all the days of Jared were nine hundred sixty and two years: and he died.21 And Enoch lived sixty and five years, and begat Methuselah:22 And Enoch walked with God after he begat Methuselah three hundred years, and begat sons and daughters: 23 And all the days of Enoch were three hundred sixty and five years: 24 And Enoch walked with God: and he was not; for God took him.25 And Methuselah lived an hundred eighty and seven years, and begat Lamech:26 And Methuselah lived after he begat Lamech seven hundred eighty and two years, and begat sons and daughters:27 And all the days of Methuselah were nine hundred sixty and nine years: and he died. 28 And Lamech lived an hundred eighty and two years, and begat a son:29 And he called his name Noah, saying, This same shall comfort us concerning our work and toil of our hands, because of the ground which the LORD hath cursed.30 And Lamech lived after he begat Noah five hundred ninety and five years, and begat sons and daughters:31 And all the days of Lamech were seven hundred seventy and seven years: and he died.32 And Noah was five hundred years old: and Noah begat Shem, Ham, and Japheth. Adam = Man. Seth = Appointed. Enos = Mortal, incurable, Frail. Cainan (Kenan) = Allergy, sorrow. Mahalaleel = the blessed God (Praise of God). Jared = shall come down (descend). Enoch = Initiated, Teacher. Methuselah = His death shall bring. Lamech = Despair lament. Noah = Rest. What does all this mean? Man is appointed to be mortal but the blessed God shall descend and teach. His death shall bring comfort and rest. God’s plan in the ten descendants of Adam. Cain = A possession A spear. Enoch = Initiated teacher. Irad = Wild, Dragon, empire. Methusael = Smitten of God. Lamech = Despair made low poor. Adah = Ornament. Zillah = Shadow. Jabel = Stream, Which glides away. Jubal = Jubilee a trumpet. Tubalcain = Worldly possession. This line is antichrist and in the next chapter you will see why. The reference used here was Click here for dictionary.com look them up for your self by copying and pasting the names into the dictionary.